Lobzang Yeshe (Tib. བློ་བཟང་ཡེ་ཤེས་, Wyl. blo bzang ye shes), the Second Panchen Lama (1663-1737) — born in Tobgyal in Tsang, at the age of six he was recognised as the reincarnation of the First Panchen Lama, Lobzang Chökyi Gyaltsen, and received the novice ordination and then his religious education from the Fifth Dalai Lama and other leading teachers and scholars. In 1697 he gave the Sixth Dalai Lama, Tsangyang Gyatso, the novice ordination as well as many special teachings. 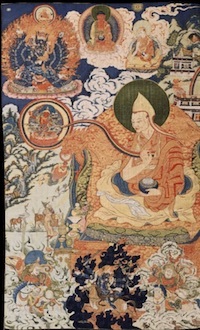 After the death of the Sixth Dalai Lama at the young age of twenty-three, Lobzang Yeshe devoted himself to the education of the Seventh Dalai Lama, Kalzang Gyatso going to Lhasa in 1720 to give him the upasaka ordination and following this with instruction in the sutras and tantras and then full ordination. The Chinese Qing, also known as the Manchu, dynasty invested him with a golden seal and gave him in 1714 the name 'Erdeni' or 'Ertini' which is Mongolian for 'Rinpoche', 'Precious One'. He travelled widely teaching and wrote four volumes of commentaries. He was invited to China by the Manchu Emperor Kangxi, but he declined on the grounds that he was too old to travel such a long way and also that he was vulnerable to smallpox. He headed Tashilhunpo Monastery for sixty-seven years before passing away there in 1737. This page was last edited on 8 June 2018, at 06:56.